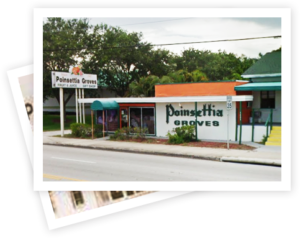 Poinsettia Groves is a small, family owned, gift fruit shipper located in the heart of the Indian River growing district in Vero Beach, FL. We’ve been shipping Famous Indian River Fruit since 1947 and are members of the Florida Gift Fruit Shippers Association and the Indian River Chamber of Commerce and are licensed by the Florida Department of Citrus. Our packing house, grove store and offices are still located on US 1 in Vero Beach featuring fresh oranges and grapefruit as well as sweet, tasty juice and an assortment of jellies, marmalades, candies and other gifts. Poinsettia Groves started as Greenleaf Groves by Harry Jones in 1947. Harry must not have cared for the citrus business because he sold to Robert and Clara Page in 1948. Robert planted quite a few poinsettia plants in the front of the packing house and changed the name to Poinsettia Groves. Apparently the Pages didn’t enjoy the fruit business too much either because they sold to Elly and Eve Dennett and Sid and Lucie Johnson in 1949. The Dennetts and the Johnsons ran the business together until the Johnsons decided to retire. 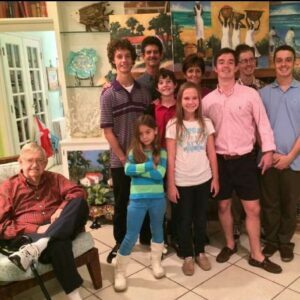 They sold their interest to the Dennett’s daughter and son-in-law Betsy and John Hudson who moved up from Miami with son Jeb-age 2 and daughter Pam-age 1 in 1957. The Dennett and Hudson families worked together until 1971 when the Dennetts retired. The next change was in 1977 when Jeb joined the business after graduating from Stetson University. Jeb runs things now while his wife, Cindy is a kindergarten teacher. They stay busy with their sons Cody, Sam, Jack, Riley and Ethan and daughters Bailey and Ava. We hope you’ll visit if you’re in Florida. We are located at 1481 US 1 in Vero Beach. We always have fresh Oranges and Grapefruit available in season, as well as Orange and Grapefruit Juice. We’ll be glad to show you around the packing house and answer any questions you may have. We’re open November through April, 8:00 to 5:00 – Monday through Friday, 9:00 to 4:00 on Saturday. We are closed from May through August and we open the office in early September from 8:00 to 5:00 Monday through Friday.